My mother who would have been 100 yrs. 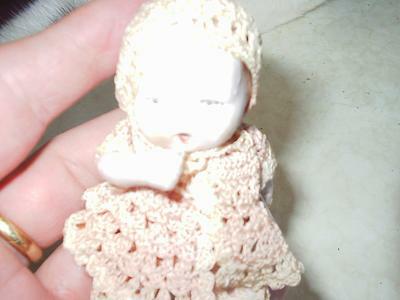 old this yr. found this doll in her grandmothers attic. It says German above the buttocks and on the middle of the back it has 821 and under that it says 9 1/2. The length is 4 inches. Arms and legs move. She is an infant so the legs are not straight out. Her mouth is open and you can put her thumb in her mouth but it does not stay in there. Your doll was made by Limbach. Hi, what is she made from? I have some old babies too! 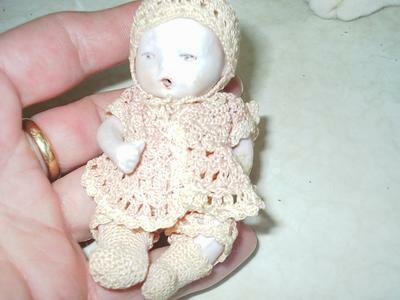 Very nice old doll. Have you looked in any of the doll antique books for help?